Product #18314 | SKU BR-3BATT-KIT | 0.0 (no ratings yet) Thanks for your rating! 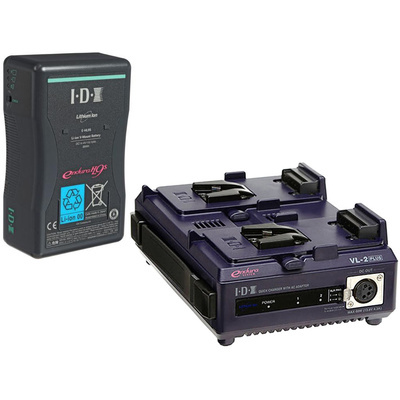 KIT INCLUDES: Three IDX E-HL10DS Lithium-Ion Batteries and One VL-2PLUS 2-Channel Quick Charger. The IDX E-HL10S is a lithium ion, V-Mount battery. It offers 95Wh for 14.4VDC equipment in a compact package. The VL-2PLUS is a two-channel, sequential Li-Ion (Lithium-Ion) fast charger with a built-in 60W power supply. Up to two Li-Ion Endura V-mount batteries can be charged in 5 hours. A lightweight design (3.3lbs) with a convenient built-in handle. 4-Pin XLR connector on the front panel for 60 watts of DC power.